ACCA F7 Financial Reporting takes an important place in ACCA qualification in foundation stage. 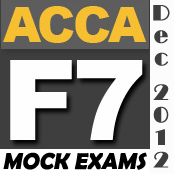 ACCA F7 is the first pure paper based all subjective and the practical financial accounting exam. The stretch of ACCA F7 if compared to its predecessor ACCA F3 Financial Accounting is almost 5 folds. As examiner expects such skills from students that require detailed and appropriate understanding of International Accounting Standards therefore, ACCA F7 course becomes even more important in professional life to follow. To prepare ACCA F7 Financial Reporting at its best students must examine their knowledge by attempting exam level mock exams in time restraint environment and assuming the same seriousness and nervousness as they would feel while in the exam hall.